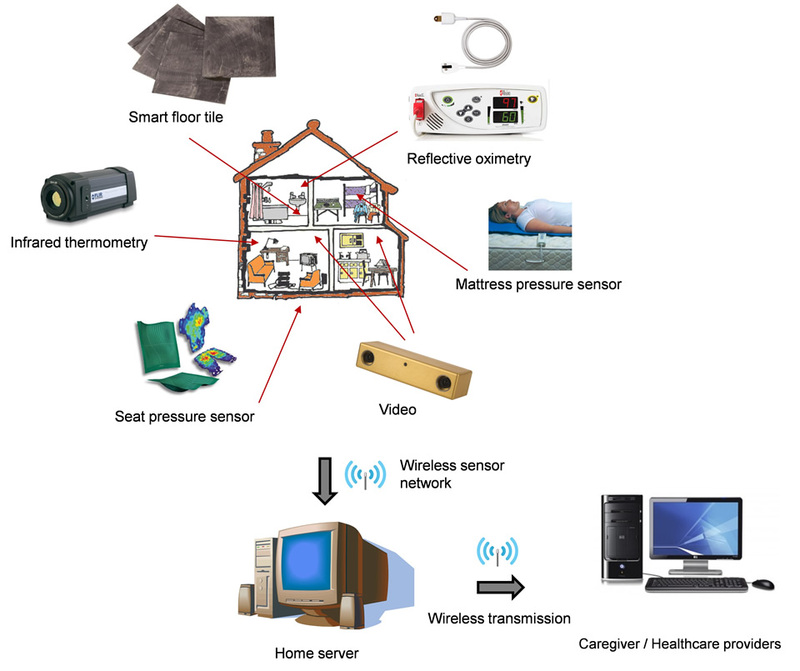 Keywords: Embedded sensing, physiology and activity measurements, smart home technology, heart failure monitoring, context-aware assessments. Heart failure (HF) is the leading cause of hospitalization in the western world and 10% of older adults discharged with this diagnosis are readmitted to hospital within the first month. HF is marked by poor quality of life and requires complex and continuous self-management. Physiological parameters such as heart rate, respiratory rate, blood pressure and body weight, along with measures of physical activity, are essential metrics in monitoring the condition of HF patients to avoid acute decompensation. For HF patients these are typically assessed through visits to a physician’s office or heart function clinic. However, many seniors are unfamiliar with the methods, frequency or actions required to self-monitor their HF, or are unable to operate the devices. Finally, current products for chronic cardiac monitoring focus on physiology (e.g. heart rate monitors) and activity (e.g. accelerometers) as separate entities which lead to uni-dimensional data, requiring the user or caregiver to interpret significance. In this project, we are designing and testing a context-aware smart home system that will autonomously monitor the physiology and physical activity of seniors without any conscious effort from the users. This novel approach will be accomplished by embedding passive sensors into the home and commonly-found objects and furniture, eliminating many of the limitations that exist with current home-based telemonitoring technologies. Specifically, our ‘zero-effort’ approach will reduce the burden that is placed on users and caregivers as they will no longer have to be familiar with the technology or understand the actions required to take the necessary measurements. The users will go about their daily routines within their own homes and a context-aware assessment of their condition will automatically be made and delivered to the appropriate stakeholders, such as the users themselves, caregivers and healthcare providers. Figure 1: Diagram of system architecture for autonomous monitoring of physical activity and physiology (click to enlarge). A. Arcelus, M. Sardar, A. Mihailidis, “Design of a capacitive ECG sensor for unobtrusive heart rate measurements,” in Proc. IEEE Int. Instrum. Meas. Technology Conf., Minneapolis, MN, USA, 2013, pp.407-410.